"The choice of a career for girls born into our circumstances presented no difficulty. Almost inevitably we were bound to go into service." 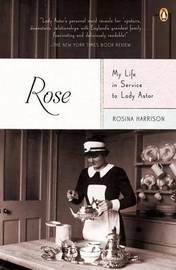 Rosina Harrison was born in Aldfield, North Yorkshire, in 1899, the daughter of a stonemason and a laundry maid. While there was little choice as to what her future would be Rose had ambition and was fortunate in having parents prepared to help her achieve her dream. When she confides that she longs to travel the world her mother replies that the only way that would be possible was by being a lady's maid. Somehow the money is scraped together to further Rose's education and to pay for lessons in French and the art of fine sewing and in 1918 she takes up the first of two positions she will hold as lady's maid to the daughters of a house. "I'd allowed her ladyship to walk over me and make mincemeat out of me. I now knew my work had been right; where I'd been wrong was in not defending it and myself when we were both under attack. I saw her in a different light, not as a mean spiteful person any more, but as someone who in her own way was putting me to the test. She wanted a maid in her own image and she thought she could get one by destroying me and then building me up again as she wanted me to be. She hadn't succeeded and from now on she wasn't even going to get the chance." The two women would remain together until Lady Astor's death . "What had begun as a battle gradually mellowed into a kind of a game between us. It went on for thirty-five years; neither of us won, neither of us lost." It is an interesting relationship to read about. Separated by the barrier of their different social class it would have been unthinkable to call it a friendship but they formed a bond founded on trust and mutual respect that never wavered. Rose achieved her ambition to travel , she stayed in palaces, country houses and the finest hotels and she met royalty, politicians and famous people of the day. Not bad for a Yorkshire country lass! The memoir, first published in 1976, is written in a simple, straightforward and honest style that makes it a pleasure to read. . It offers a fascinating glimpse of real-life 'upstairs and downstairs' in both the post WWI & WWII eras and I enjoyed it immensely. Thanks to Netgalley and Penguin USA for the opportunity to read and review.